As chance would have it, my route yesterday took me (somewhat) near the legendary Sandy Ridge Reservation in Lorain County (a Lorain County Metro Park). Scores of notable birds have been seen here over the years, in large part because of the reservation's sharp-eyed and knowledgeable naturalist, Tim Fairweather. A two mile long path cuts through mature woods then circles some large wetlands. I had only been to the nature center once or twice to give talks, and had never seen the real meat of the park. Time to correct that, so I grabbed some camera gear and took to the loop trail to see what I could see. I had barely broke free from the woods when a distant menacing shape caught my eye. There, perched on a snag in a dead tree out in the wetland, was a Merlin. These muscular little falcons are among a small bird's worst enemies; feathered Freddie Kruegers. I had scarcely registered the Merlin when the male Downy Woodpecker in this photo bounded in low over the marsh and swooped up into a nearby tree. It apparently had been out working the drowned snags, and the Merlin came in too close for comfort. The woodpecker pressed itself to the trunk, and remained quite still for several minutes. In the photo, it is casting a glance backwards in the direction of the predator. Shortly after the Merlin departed, the woodpecker skedaddled to somewhere else. Such uncharacteristically frozen postures are sometimes adopted by songbirds and other small birds such as this woodpecker when avian predators are close at hand. You've perhaps seen chickadees or other feeder birds do it when a Cooper's Hawk barrels into the backyard. I have heard this behavior termed "sleeking", as the potential victim presses its feathers down and attempts to become one with its surroundings. It's probably not the best descriptive word for this, but I've always liked the sound of it. 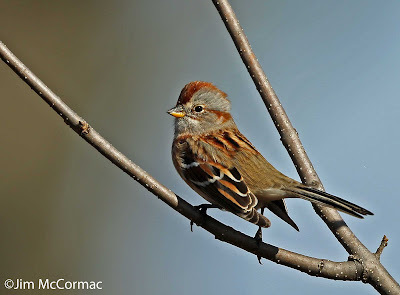 Towards the end of the loop around the large wetland, I encountered a small flock of American Tree Sparrows. Their airy crystalline tinkling notes gave them away well before I got near, and I was prepared to try for some imagery. If I were ever forced to name a Top 10 list of favorite birds, this species would be on it. And one can never have too many photos of a Top 10 favorite bird, especially one as delicately stunning as this. The animals were not put off by my furtive skulking, and I was able to observe some of their food choices. I was pleased indeed when the sparrow in the photo alit atop this old withered inflorescence of blue vervain, Verbena hastata. My first reaction was to the pleasing aesthetics of the situation, but became more meaningful when the bird began avidly ripping seeds from the candelabra of cylindrical flower (now fruit) spikes. This was not a plant that I've observed American Tree Sparrows feasting upon before. American Tree Sparrows, when they arrive at these southerly latitudes for the winter (I've written more about this species HERE), are much tied to open meadows that grow a diversity of herbaceous plants that produce bumper crops of small seeds. Goldenrods are especially favored, but the sparrows feed on a wide variety of other plants, especially those in the sunflower family (Asteraceae). Over the long haul, I am sure these plucky little sparrows are major dispersers of many of these plants. Unfortunately, prime American Tree Sparrow (and many other songbirds) foraging fields are all too often thought of as weed fields. While nearly everyone gets up in arms over protecting bogs, old-growth forests, and prairies, the much more mundane goldenrod and aster-dominated meadows are shrinking away, the victims of various development. These common and largely ignored meadows are biodiversity factories, and even fuel topnotch beauties such as the American Tree Sparrow. Today is something akin to a national holiday in these parts - the annual Ohio State Buckeyes vs. Michigan Wolverines football game. This matchup has taken place since 1897, interruptedly, and annually since 1918. It's huge; easily the most important game of the year for these schools. I wouldn't miss it if at all possible. Since it was a noon game, there was little time for any sort of full blown excursion. But my trigger finger was itching, and I really wanted to shoot something. Fortunately, a light rain had fallen more or less steadily all night and into the morning. The precipitation made for prime conditions for the photos that follow. By the way, OSU easily walloped the team from up north, 42-13. 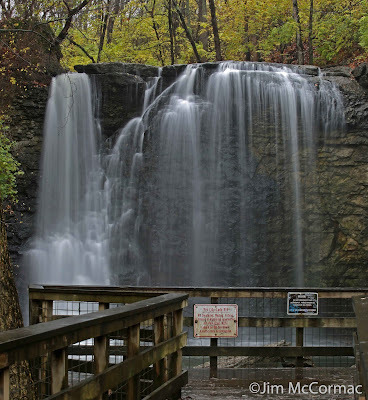 Back on October 29, I made a visit to a local hotspot and one of Ohio's most beautiful waterfalls, the Hayden Run Falls. I wrote about that, with photos, HERE. That trip came on the heels of a torrential gulley washer, and the falls were raging. The above photo is one that I made that day. I couldn't keep the camera trained on the falls for more than a shot or two, due to the prolific mist of atomized water drifting onto the lens. There is such a thing as TOO much water when shooting waterfalls, at least sometimes. Hayden Falls, as it looked this morning at first light. The volume of water cascading over the 25 foot cliff is heavy, but much less than in the previous photo. Just about aesthetically perfect, to my eye. Where the heavy flow looks cool, it lacks details and resembles a dense watery curtain. Today's lesser flow produced nuanced details. The limestone cliff face appears opaquely in the backdrop, and individual flumes of water separate from one another. Many cascades are produced where torrents hit small ledges and atomize. Perfect. Also, by getting there at first light, two good conditions were met. One, the completely overcast sky made for perfectly even lighting, and allowed for the use of very slow shutter speeds. Sunny conditions are not good for waterfall photography. The resultant dappling of light and shade creates uneven conditions, and bright light makes it harder or impossible to use a desired VERY slow shutter speed. Two, by going early on a misty morning, there are no other people present. This place, understandably, has a magnetic lure and rare is the time there are not visitors standing on that platform ogling the falls. Small wonder that nearly everyone who picks up a camera wants to make waterfall shots. They are beautiful highlights of the landscape. 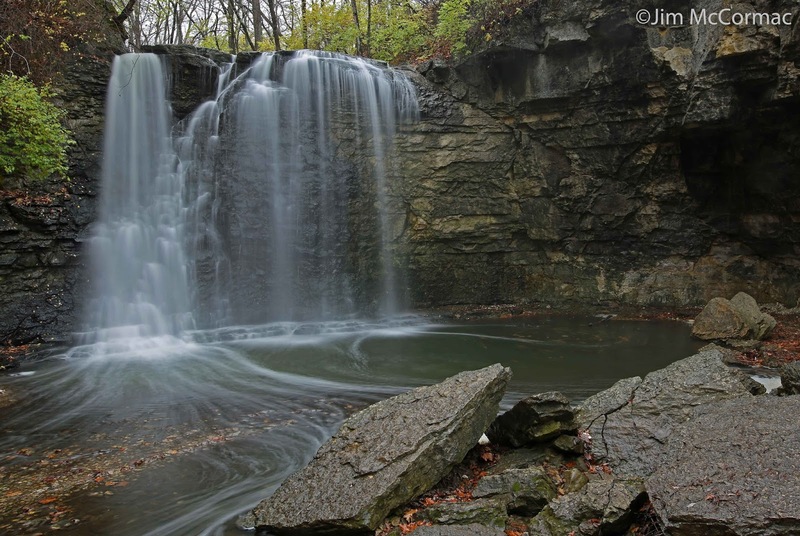 In its most base form, shooting a waterfall photo is simple. Just point your camera at it and snap away. You'll probably get something OK; maybe even something your friends will ooh and aah over. 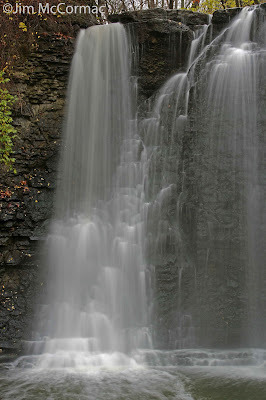 To really try and capture the artistry of a gorgeous waterfall requires a bit more effort. A tripod is essential due to the slow shutter speeds that should be used. Having the camera stationary on a tripod also helps immensely in composing the image. For this shot, I wanted the falls to the left in the image, and much of the cliff face and the rocky grotto showing on the right. The huge limestone slabs in the foreground create interest, and I made sure to include as much of those as possible. I absolutely detest the invasive nonnative Amur honeysuckle, Lonicera maackii, but there was no way to keep it out of the shot short of major post-editing Photoshop work (and I am a post-editing minimalist). So, I used its still green foliage to provide some colorful punctuation to the left, and above, the falls (really had little choice). I made these images with my Canon 5D Mark III, and it has a cool device helpful for composition - an electronic level that can be shown on the back screen. It lets you know when the field of view is perfectly flat. An inexpensive remote shutter release plugged into the camera allows for tripping the shutter without touching the camera and possible introducing some shake. So, when all looks good just stand back and pull the trigger. This shot was made with the amazing Sigma 24mm f/1.4 Art lens. Settings were f/16, ISO 100, 4 second exposure. 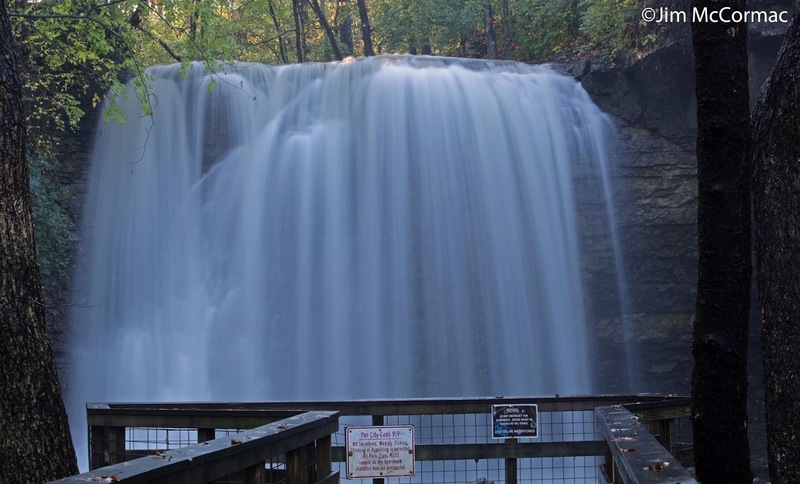 The very long exposure softens the falling water, and creates the interesting plumes of whitewater trailing away from the base of the falls in the pool below. To me, the left side of the falls was the most visually interesting. So, I clipped on another great landscape lens, the Tamron 70-200mm f/2.8. This focal range is superb for a great diversity of shots, and is a must for the camera kit. The Canon version is significantly more expensive, and I can't imagine it is much if any better than the Tamron. I've gotten many keepers out of this lens. Shooting this perspective was a natural for a vertical orientation. The lens was zoomed ever so slightly to 79mm, and the settings were f/11, 0.8 seconds, and ISO 100. Framing was dictated by a few factors. One, I couldn't get back any further or the handrail of the boardwalk would appear (It's prominently posted not to leave the boardwalk. Better compositions could be made if one did, but abide by the rules). I wanted to pull in tight on the left side of the falls to carve out as much of that blasted honeysuckle shrub as possible. And I wanted that cool looking mini cascade of water fluming over the cliff at the top right of the image to be in the frame. Voila! The effect is of a junior Niagara Falls right here in urban Columbus, Ohio. The mouth of the Huron River on a beautiful late November day. The Huron Municipal Pier stretches off into the distance, ending in Lake Erie. Look closely, and you'll see a white lighthouse-like signal tower at the end. I journeyed back to this locale last Sunday, arriving around 8 am, and immediately headed out to the signal tower at the pier's end. Temperature at the start was about 27 degrees F, warming to a high of 33. Still a bit too nice weatherwise for producing crazy bird numbers and diversity, but much better than my last Huron trip in that regard. Some of the photos in this post are certainly not award winners. They are purely documentary, of rarities that did not cooperate with the photographer. While conducting lake watches and tallying the birds that pass by on Lake Erie is fun, it often does not produce great photo ops, at least of the more unusual stuff. Many of the birds are simply too far out for that. Birds swarm the mouth of the Huron River. Most of them on the water are Red-breasted Mergansers, with numerous gulls overhead. An enormous feeding flock of mergansers settled in at the river's mouth towards day's end. At one point, the birds on the water stretched for a quarter mile or so, and there were probably 10,000 plus on the water, maybe more. I spent most of my time on this foray at the base of the white tower, which offers a great perspective on the lake, and the river. Many birds fly by fairly closely at this point, and the abundant fishery spawned by the interface of river and lake lures scads of piscivorous birds into close proximity. Once ensconced at the tower's base, it's hard to leave, at least on an active day. And this day saw lots of action. Gulls, overwhelmingly Ring-billed Gulls with lesser numbers of Herring Gulls, cram the little beach at the pier's beginning. 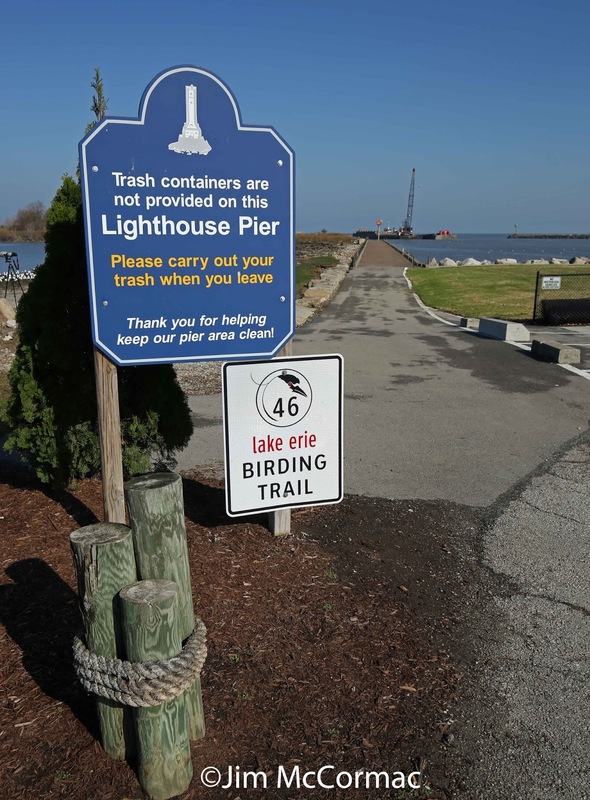 Huron, Ohio, is one of the birdiest spots on Lake Erie. 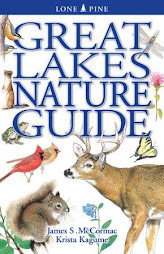 I've been traveling to our Great Lake for many years - hundreds of trips - and have seen firsthand nearly all the honey holes. This place is high on the list of my favorites, for two main reasons. One is the sheer number of birds that concentrate here. Only the most jaded or intellectually incurious would fail to be struck by the tens of thousands of gulls and ducks that swirl around the river mouth on a busy day. Two, the prospect of rarities makes Huron a constant lure, especially in November and December. Ohio's first records of Pacific Loon, Spotted Redshank, and Arctic Tern came from here. I was in on the loon, back on December 7, 1985. While the possibility of mega-rarities always exists, lesser rarities are almost to be expected here, which always spices up a trip. We can thank the fish for the spectacular bird concentrations here, and elsewhere on Lake Erie. An adult Bonaparte's Gull attempts to quickly choke down a gizzard shad that it just deftly plucked from the water. If the little gull doesn't act fast, it will quickly be set upon by larger gulls who will attempt to pirate the fish. 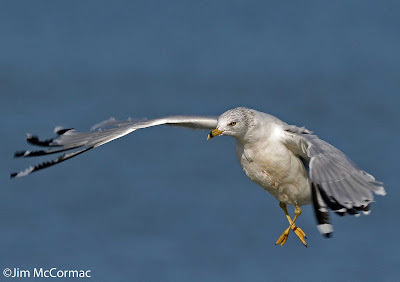 Theft such as this is known as kleptoparasitism, and kleptoparasitic incidents are frequent as scores of thuggish larger gulls stalk the hard-working Bonaparte's Gulls. I'll show you one of the kings of kelptoparasitism in a minute. This photo, which I made from the aforementioned signal tower, is classic late November Huron action. A Bonaparte's Gull hovers over some fish, while a Common Loon looks on. To the far right, head peeking above a wave, is a much smaller Horned Grebe. One-day estimates numbering into the tens of thousands have been made here for the gull. While this day's Bonaparte's tally was only a few thousand, at best, the Horned Grebe total was huge. They were everywhere, and I saw at least 300 from my lakeside perch. Ah! A much better look at one of the hundreds of Common Loons that were in the area. Lake Erie is a major migratory corridor for loons, and if I saw a few hundred from this one spot on this one day, I wonder how many were on the lake in its entirety. Most regular birders along the lake that I've talked to are reporting large numbers of loons this fall. This was "Bird of the Day", to be sure. While I was holed up on the east side of the tower, out of the wind, Robert Hershberger and crew showed up but stayed over on the breakwall. When I finally walked around to say hello, Robert gestured wildly and I quickly transited the rough limestone blocks that separate pier and breakwall. He had spotted this Pacific Loon, well out in the lake and off to the west. This is the species that was first found in Ohio in nearly the same spot, 30 years ago. The photo is not great, but it is identifiable. This species is noticeably smaller and trimmer than the Common Loon, which was quite evident when the two were in close proximity. It also has a much more rounded head, unlike the big blockhead look of a Common Loon. The bill is thinner and less massive, and the neck is much more clearly patterned in a tri-tone effect: white throat, dark sides, and lighter brownish-gray on the nape. This bird is a juvenile, as evidenced by the white checkerboarding on the back. The Pacific Loon stayed near the river mouth the entire time, but well out on the lake. I made this image later in the day, which shows another Pacific Loon field mark, that delicate little chinstrap under the bill. While it may appear that the bird must have been fairly close, this image was made with the Canon 5D Mark III mounted to Canon's 500mm f/4 II lens. A 1.4x teleconverter was sandwiched between camera and lens, making for a focal length of 700mm. Then the photo was hugely cropped down. In reality, the bird was visible but not identifiable with the naked eye, and barely identifiable through binoculars if the observer knew the species well. Since the inaugural 1985 Huron Pacific Loon, there have been at least a half-dozen other indisputable records, probably more. Hot on the heels of this bird were two others found in the Cleveland area. It may be that 1) there are more Pacific Loons these days, leading to more vagrants; 2) they have altered their migratory pattern somewhat, or 3) birders are becoming more adept at finding and recognizing them. I vote for #3. A handsome little bird indeed is the Horned Grebe. Click the photo to enlarge, and admire its rubylike eye. Note also the massive lobed feet trailing behind. Like their close allies the loons, these grebes are expert divers. I don't think I've ever seen so many Horned Grebes at one spot as I did this day. Hundreds were out on the lake, and many would obliging swim near my outpost on the tower, or near the pier in the river. At the very end of the day, I made one last scan of the river, and noticed this pod of four grebes. Their ranks included another rarity! The three on the left are Horned Grebes, while the bird on the right is an Eared Grebe. Note its smaller size, duskier face, and steep forehead and peaked crown. A handful of Eared Grebes are reported annually in the state, and it's always a treat to encounter one. While I was standing on the breakwall with Robert, he spotted this White-winged Scoter in flight, and the bird put down offshore for a few minutes. A bit later, I spotted a Black Scoter skimming along, and it also settled on the water for us to admire. In general, scoters were scarce this day, and I only saw five or so. On the best November days - usually when the weather is the absolute worst for bipedal observers - dozens or hundreds of scoters might fly by this point. Between Robert and I, we saw at least three jaegers. I spotted this bird well out on the lake as it streaked over the waves heading west. None of the jaegers came into the river and hung out, as we were hoping. This bird is an immature, as most Ohio jaegers are. I believe it is a Pomarine Jaeger, due to the double flash of white under the wings at the base of the primary feathers, and the strongly two-toned bill. In the field, it had a large bulky appearance; an impression given by the largest of our jaegers. As always, though, I welcome corrections from those who may know better. I certainly do not see many jaegers and am no expert on their identification. Jaegers are the Kings of Kleptoparasitism. They make much of their living by hounding gulls and terns in spectacular aerial chases, eventually forcing the victim to disgorge its fishy catch. Watching one in the act of mugging some hard-working fish-catcher is truly impressive, and that's what I was hoping for this day. But the jaegers that we saw apparently had business elsewhere and didn't linger. A squadron of Red-breasted Mergansers shoots by, two males in molt and seven females. At least 10,000 and probably far more than that of these fish-eating ducks swarmed in the area on this day. The peak passage of Red-breasted Mergansers in November on this part of Lake Erie is truly impressive. I made many images of these birds on this day, and want to discuss them in a separate post. I made a whirlwind trip to the state next door last weekend, Indiana. The Indiana Native Plant and Wildflower Society was holding its annual meeting, which is a big affair. In this photo, which I made with my iPhone from the balcony of the conference room at Indiana University - Purdue University Indianapolis, Doug Tallamy orates to the group. It was a packed house - about 350 attendees. They take their flora seriously in the Hoosier State. I was flattered to be asked back (3rd or 4th time!) to speak, especially given the otherwise star-studded lineup: Doug, Rick Darke, Mike Homoya, and Kevin Tungesvick. It was a great time, and fun to catch up with lots of people and hear some great talks. Kudos to all of the conference organizers and volunteers for the usual bang-up job. Mid-November in Indiana means crane time, though, as in Sandhill Cranes. And the Mecca for Hoosier State cranes is Jasper-Pulaski Fish & Wildlife Area, which is in only two hours or so northwest of the conference venue. Even though I've made the Jasper crane scene a number of times, at the last moment I decided to stay over there and arrive at the big crane field the following morning before daybreak. This decision was partly based on the weather - it was to be a bright clear day, and every other time I've been, the skies have been leaden-gray. Blue ether would make a better backdrop for photography, of course. The observation tower casts a long shadow over Goose Pasture as the sun pops over the horizon. This mammoth field serves as the gathering ground for myriad cranes before they begin their day, and again in the evening before they fly off to the marshes to roost for the night. I prefer being here as the sun rises, for a few reasons. One, the light is to your back. Two, there are generally way fewer people than in the evening. Sometimes the viewing platform is overly packed for the dusk show, but even on this beautiful Sunday morning, just after sunrise, there was plenty of room for everyone and our tripods. Assembled crane enthusiasts admire assembled cranes in the field beyond. I was told that estimates put the number of cranes at about 8,000 birds, but it didn't seem like that many to me. Nonetheless, there was certainly no shortage of the spectacular animals. This scene is kind of Disneyesque and I couldn't resist making the shot. A trip of Sandhill Cranes wings by while a White-tailed Deer gallops along, and a loose assemblage of more cranes loiters in the backdrop. Such is Jasper in November. While there are places where far more cranes gather than here, J-P is still an amazing experience. People come from near and far to drink in the sight of these fabulous giants flying about, wings spanning well over six feet. Cranes are vociferous, and the air resounds with their primitive guttural rattles. As the sun cleared the horizon, its rays began to cause flying cranes to glow with beautiful golden tones, and the click of cameras accelerated. I met some new friends on the platform, and we had a great time shooting birds, talking photography, and alerting each other to incoming opportunities. Mike Bader was one of them, and some of his stunning work can be seen RIGHT HERE. In general, bird photography is a solo pursuit, but in this case it doesn't matter. The cranes are probably going to act the same whether there was just one person hiding under the platform, or 75 people gabbing away on the deck. A gorgeous red-capped adult crane wings right over the platform. I shudder to think how many images were clicked off of this bird. It sounded like mini machine guns going off. I shot this one with my Canon 7D Mark II which fires ten frames (rounds) a second, and there was plenty of similar hardware aimed at the bird. There must be millions of (camera) shots fired at cranes at J-P during the peak fall migration. Sandhill Cranes remain together as family units throughout winter and well into spring. Many of the groups have at least one juvenile in tow. Here, a youngster trails an adult. 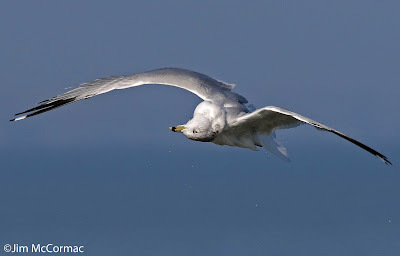 The juveniles give a distinctive high-pitched whistle in flight, sometimes drowned out by the adults' raucous rattles. Jasper-Pulaski should be prime for cranes into mid-December, so if you're looking for an interesting avian experience, check it out. When it comes to mimicry, few bugs rival walkingsticks. They are twigs come to life, moving with a lackadaisical swaying gait and chewing the leaves around them. A walkingstick must be seen to be believed. Even the family name, Phasmatodea, points to their nearly magical appearance. It’s derived from the Greek phasma, which means phantom — an allusion to the insects’ incredible similarity to sticks. Worldwide, there are some 3,000 species of walkingsticks. Peak diversity occurs in tropical regions. The longest known insect belongs to this group, the little-known Chan’s megastick of Borneo. One of six specimens of this near mythic bug is in the London Museum of Natural History. It measures more than 22 inches long. The common stickbug in Ohio is the Northern walkingstick, Diapheromera femorata. Common as they may be, walkingsticks blend so well with their surroundings that most go unnoticed. Also, they generally are more active at night and tend to stay high in the trees. I made the accompanying image recently in a large southern Ohio forest. 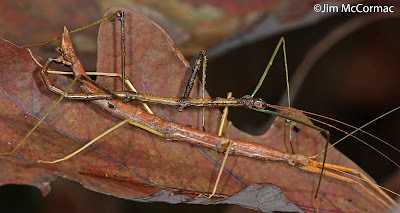 The much smaller male stick is on top, mated to a female. In my experience, walkingsticks descend to lower levels in late fall and are easier to find. Walkingsticks’ mating embrace can last for days. Their stamina is probably not due to an infusion of self-manufactured super Viagra, but because of the male’s need to protect his genetic stock. If he were to leave the female before egg fertilization, interlopers would likely knock his sperm away and replace it with theirs. When the reproductive process is complete, the female begins dropping eggs in the leaf litter. The eggs resemble plant seeds to a remarkable degree. In some walkingstick species, ants are duped into absconding with the eggs. They cart them to underground nests, where the ants feast on a tasty appendage attached to the egg, but leave the embryo alone. The eggs are thus safely guarded, and the hatchling stick resembles an ant. It eventually makes its way from the nest and into the trees. Newly emerged walkingsticks resemble tiny versions of the adults. The Northern walkingstick goes through about five molts, growing with each shed of its exoskeleton. A fully grown female can stretch to 4 inches. Northern walkingsticks are eating machines, consuming prodigious amounts of leaf tissue. In a large forest, there are so many leaf-eating sticks that they become an integral part of the forest ecology. Their collective droppings enrich the complex humus of the forest floor. In Tolkien’s middle-earth fantasy world, Ents are treelike creatures. Walkingsticks are real-life Ents, lacking only the voice of Tolkien’s tree people. UPDATE: Note below that I lamented the too nice weather during my trip last Wednesday. Well, the weather changed big time the following day, and a few Cave Swallows, a Red Phalarope, and two Franklin's Gulls were found at this very spot yesterday. Then, 22 Franklin's Gulls were in about the exact spot where I photographed the Lesser Black-backed Gull this morning. Bad weather means good birding along Lake Erie. I visited one of my favorite Lake Erie haunts yesterday, Huron, Ohio and its famed municipal pier. This is stop #46 on the Lake Erie Birding Trail, and one of the lake's true birding hotspots. I've been coming here for many, many years, and have seen lots of great birds from this pier. My hope was for bad weather, and my plan was to perch by the lighthouse at the pier's end and conduct a "sea watch". Rough weather in November can produce lots of scoters, big numbers of gulls, and perhaps jaegers or other rarities such as Red Phalarope. Alas, the weather was too nice - calm seas and very Indian Summerish, with temps ultimately hitting 60F. Nonetheless, I trundled out the 6/10th mile long pier to the end, with much gear in hand, to see what might happen. Not much was going on at the lighthouse, which wasn't surprising. The lake was flat and waveless, and skies were blue. Well, at least the light was great for making photographs, so that's what I did. 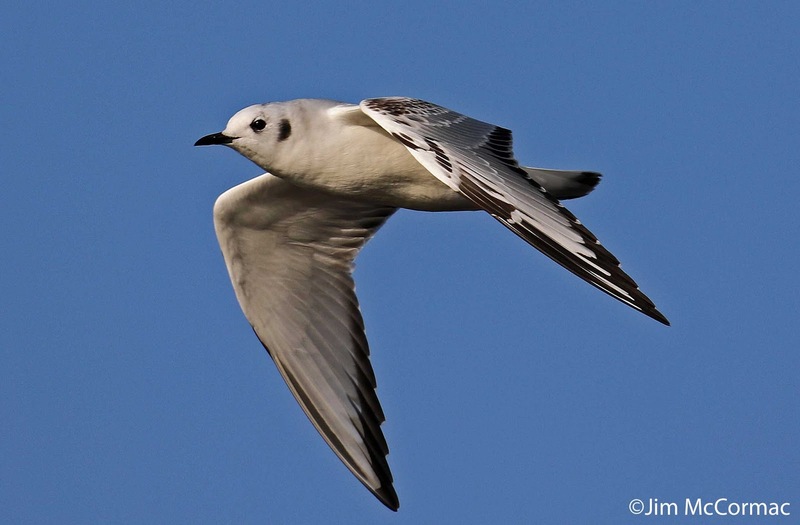 This juvenile Bonaparte's Gull was making a regular loop around the lighthouse, so I committed him/her to pixels. 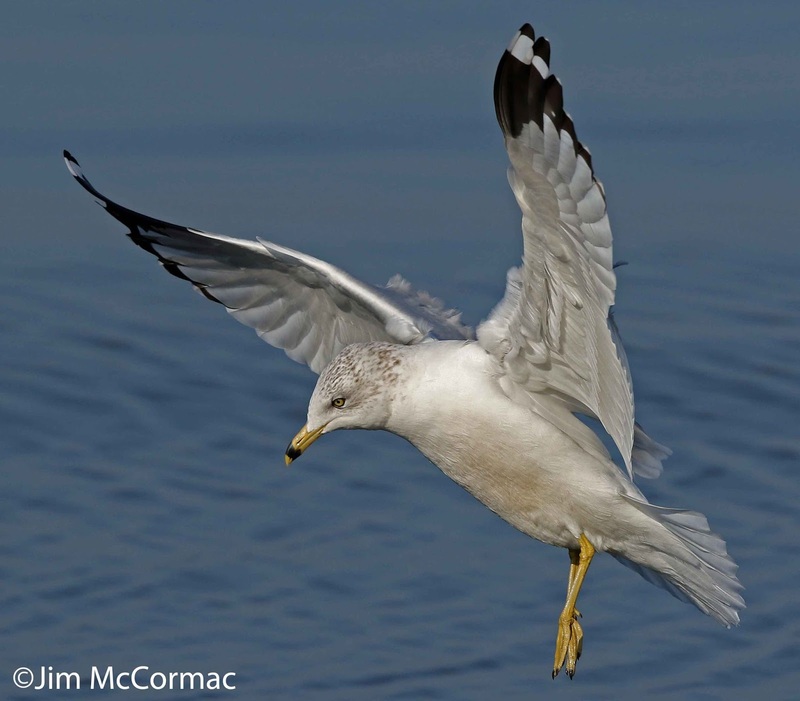 On a cold blustery day in November or December, the Huron River and adjacent Lake Erie can swarm with many thousands of these small gulls, and big concentrations often have rarities like Little Gull in their ranks. There is a small peaty beach just a stone's throw west of the pier at its juncture with the mainland, and I was pleased to find this beautiful Lesser Black-backed Gull there on my return. I was able to make a wonderful series of images of the bird. I wrote a thumbnail sketch of its status in North America and Ohio a few years back; RIGHT HERE. The early morning light offered near-perfect illumination of the several hundred gulls that roosted on the beach and nearshore waters. Given the unlikelihood of rarities due to the nice weather, I settled in to watch the gulls for a while, and secure some images. Shooting sitting gulls isn't exactly difficult. They're pretty big, and usually relatively unwary. Thus, to avoid gull shots that look like 10,000 other gull shots, I like to try and catch them doing something interesting. If you wait and watch long enough, they will. 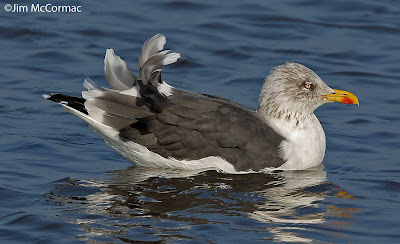 An adult Herring Gull, sporting the dappled browns of its winter plumage, drops its pink landing gear. Flying gulls are a few notches up the difficulty scale from perched gulls, but still not too tough to pull off. They are often predictable in their flight patterns, and depending on the wind, frequently fly with a rather languid manner. However, capturing good images of certain of their aerial hijinks can be hard. An adult Ring-billed Gull drops to the water. Much of one's success with shooting flying birds, gulls or otherwise, depends on how the camera is set up, and the type of lens that is used. A fast shutter speed is essential, obviously. I shot this image and those that follow at 1/2000 of a second, give or take. 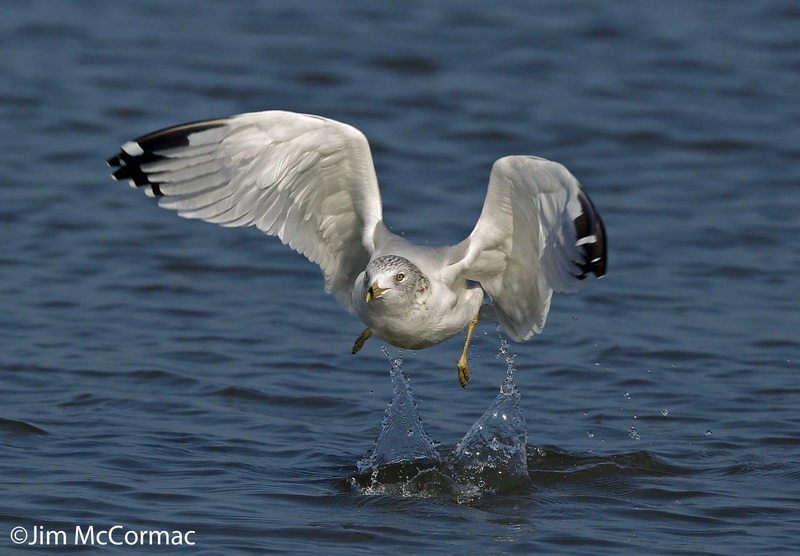 A Ring-billed Gull jumps from the water, creating mini waterspouts. The Ring-bill is by far the most common gull in Ohio, in most places at most seasons. 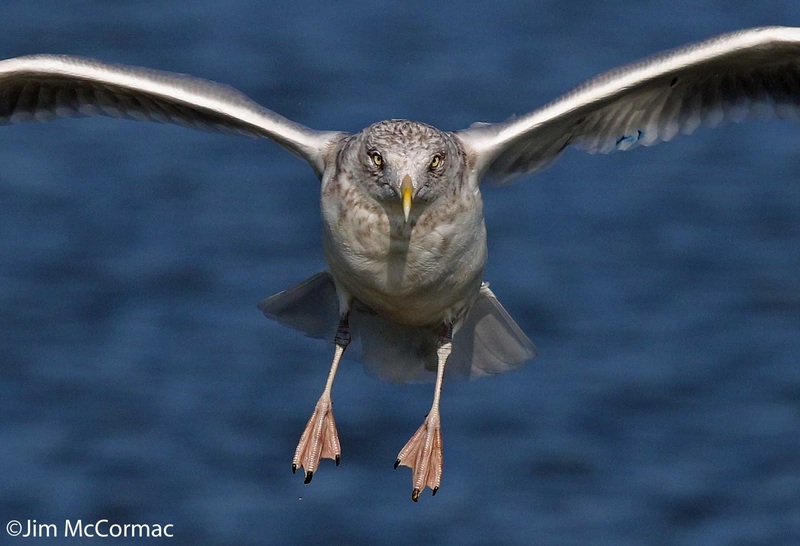 As winter sets in on Lake Erie, their numbers will often be matched or bested by Herring Gulls. 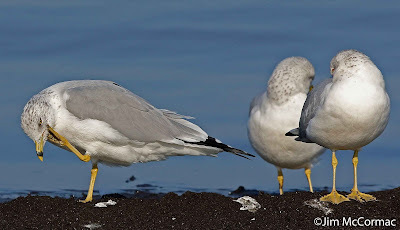 But on this day, the Ring-billed Gulls were the dominant gull. I've got scads of images of them, but the lighting and overall setup in this spot was too good to pass up. One interesting gull habit that you may have noticed is their tendency to execute a brief rather violent shimmy soon after take off from water. This hard shake blasts the water from the plumage, and in the process the gull's contortions take on some interesting appearances. I spent quite a bit of time and effort trying to freeze the birds in mid shimmy-shake. It isn't as easy as it might seem. In spite of having a pretty good idea that a recently launched bird might do this, it's still a bit tough to track it smoothly with the camera, and freeze the action. 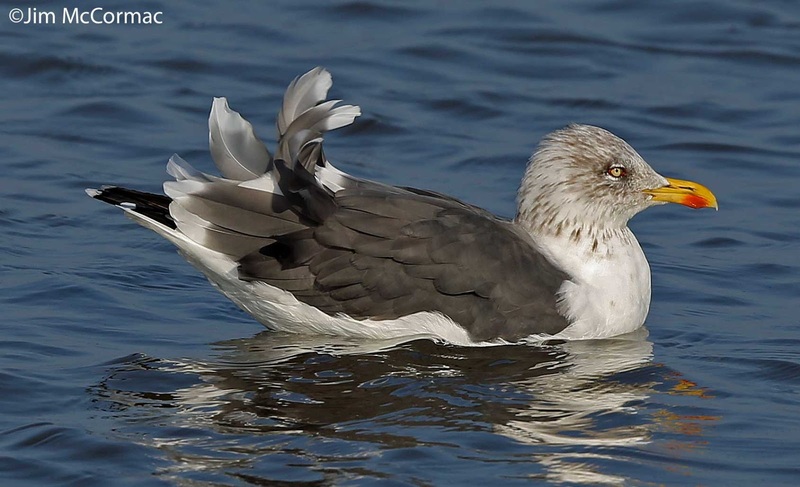 This Ring-billed Gull is in the midst of some interesting water-shedding gyrations. This image was made at 1/2500, and it still didn't totally freeze the violent wing thrusts of this Ring-billed Gull as it shook fiercely in midair. Notice the turbulence buffeting its primary (outermost) flight feathers. This is what I was really trying for, and the vast majority of my efforts failed. This one, though, is a keeper. 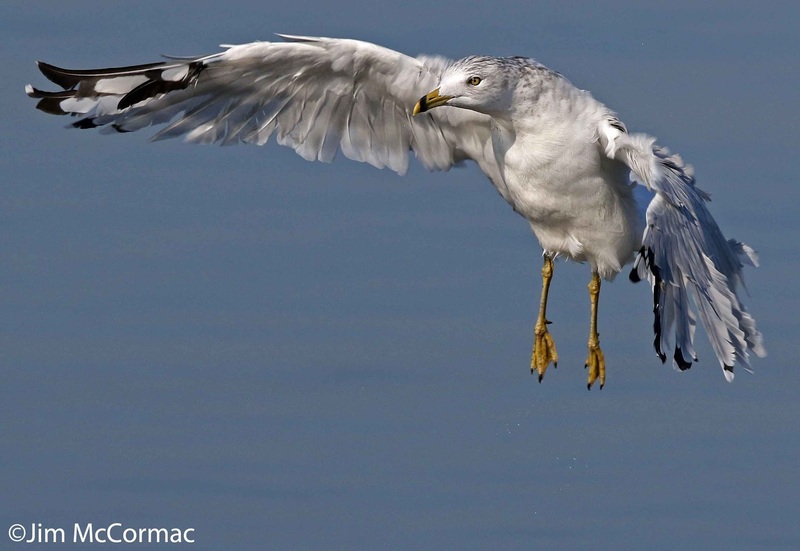 When the gulls do their shimmy shake, they often briefly invert their head and it looks like they are flying upside down. This whole shake and shudder stunt lasts only a second or two, and the bird will only be in this head down position for a fraction of a second. Watching birds' behavior, even very common species, can sometimes reveal interesting opportunities to make out of the ordinary photographs. 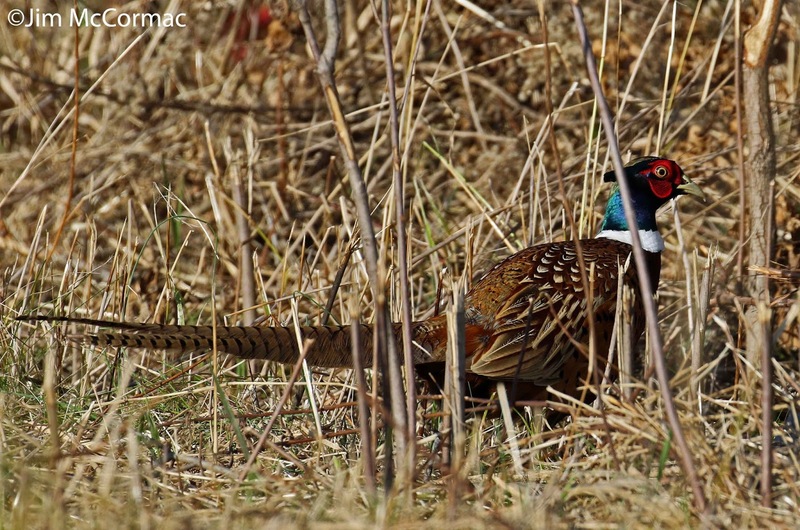 A rooster Ring-necked Pheasant skulks through thick brush in north-central Ohio last Saturday. I saw a number of these flashy birds on this day, and many orange-coated hunters trying to bag one. Pheasants are as tasty as they look. Ring-necked Pheasants are not native here, as I'm sure you know - they hail from Asia, but have been intentionally spread far and wide. 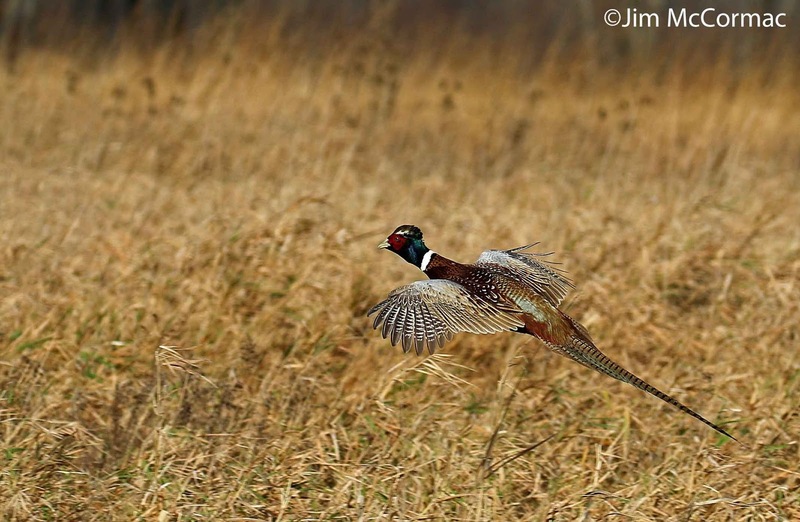 Efforts have been made to establish pheasants in nearly 50 countries, with varying degrees of success. The only continent that has been spared the ring-necks is Antarctica, where they'd have no chance at all. This spectacular bird can fare well in North America, if conditions are right. Indeed, South Dakota has become a Mecca for pheasant hunters, and the Mount Rushmore State even boasts the world's largest piece of pheasant statuary, a behemoth effigy standing 20 feet tall and extending 40 feet from breast to tail tip. 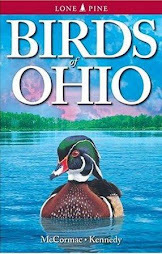 Apparently ring-necks were first released in Ohio in 1896, and while they've had their ups and downs, releases are still widespread and regular. They do fairly well in some areas that still have decent habitat, but are nowhere near as frequent as they were in the early to mid 1900's. The birds that I photographed here were probably very recent releases. 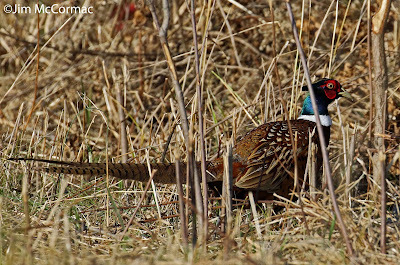 A rooster ring-neck whirring across a late autumn field of browned grasses makes for a pleasant pheasant sighting indeed, and even though I will never put these birds on the same plane as our native species, they do make irresistible eye candy. I was, as the Boy Scouts say, "[be] prepared", and that's how I got this shot. When cruising interesting country, I like to have the bird camera on the front seat and ready for action. While slowly trolling a backroad, I spotted this bird slinking through the grasses. I stopped the car, camera in hand, and quietly attempted to exit the vehicle. That was too much for the bird, and it took wing, heading for the meadow on the opposite side. It gave me enough time to click off a few shots before it dropped into thick cover. The image was made with the Canon 7D Mark II and Canon's 100-400 f/4.5-5.6L II lens. This combo is, for sure, one of the best for shooting birds, in flight or otherwise. Settings were f/5, 1/1600, ISO 100, and exposure compensation -2/3rd. I had the camera set on aperture priority and ISO on auto. For the place and conditions, those were good general default settings in case something happened fast and there wasn't time to fiddle about. As always now, I used back button focusing (read Art Morris's nice description HERE). The 7D has 65 focus points, and they are adjustable in many ways. 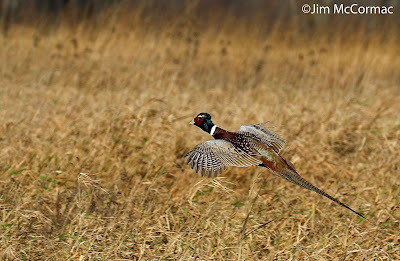 When knowing or suspecting that I'm going to be shooting larger birds, I usually have the center point active as well as the four surrounding points. That was the case here. This gives a nice tight block of five clustered focus points, and if you're tracking the quarry smoothly, you ought to connect with one of them. Of course, the camera was set on high speed burst mode, and in the 7D's case that's 10 shots a second. It's like a photographic machine gun, and such rapid bursts up one's chance of getting a keeper. In spite of this, by the time I acquired the bird in the lens, and hit the shutter, I only got off a partial burst before it vanished into the grasses. While all or some of this may sound complicated, it really isn't. A little study will break it all down easily enough. The cameras and associated gear grow ever more amazing, and we might as well try and take advantage of what they've got to offer. 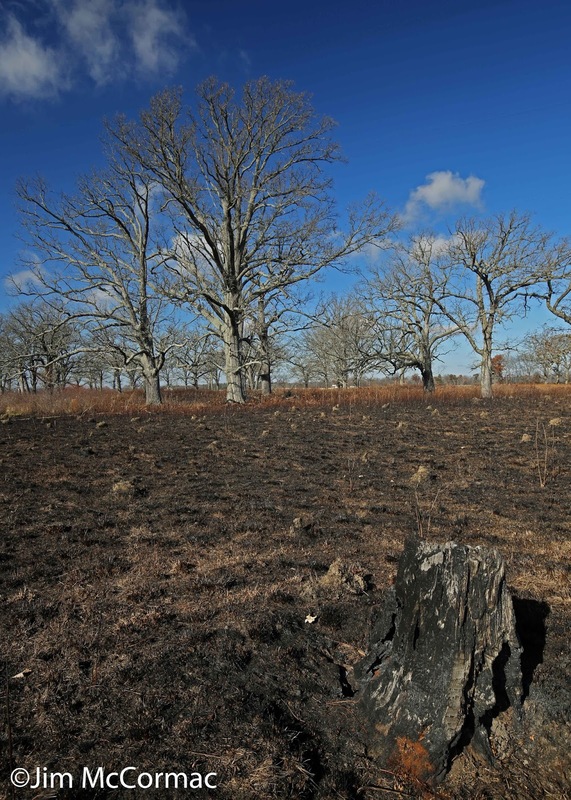 Freshly burned over, Daughmer Savanna in Crawford County awaits botanical renewal with next year's growing season. 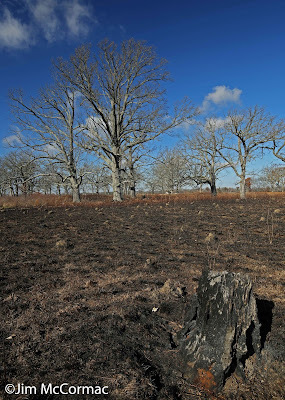 Prairie ecosystems and fire are yin and yang, the fire performing many roles: keeping woody plants from choking out sun-loving prairie plants, discouraging nonnative invaders, providing a big infusion of nutrients to the soil, and heat-scarifying the seeds of plants. I had chance to drop by here last Saturday, unbeknownst to me, hot on the heels of a controlled burn that was orchestrated by ODNR's Division of Natural Areas. The Division stepped in and purchased this gem a few years back, when it went up for auction. Daughmer Savanna is one of the finest prairie savannas left in Ohio, and one of the few that remain. About 99.9% of this habitat has been destroyed. 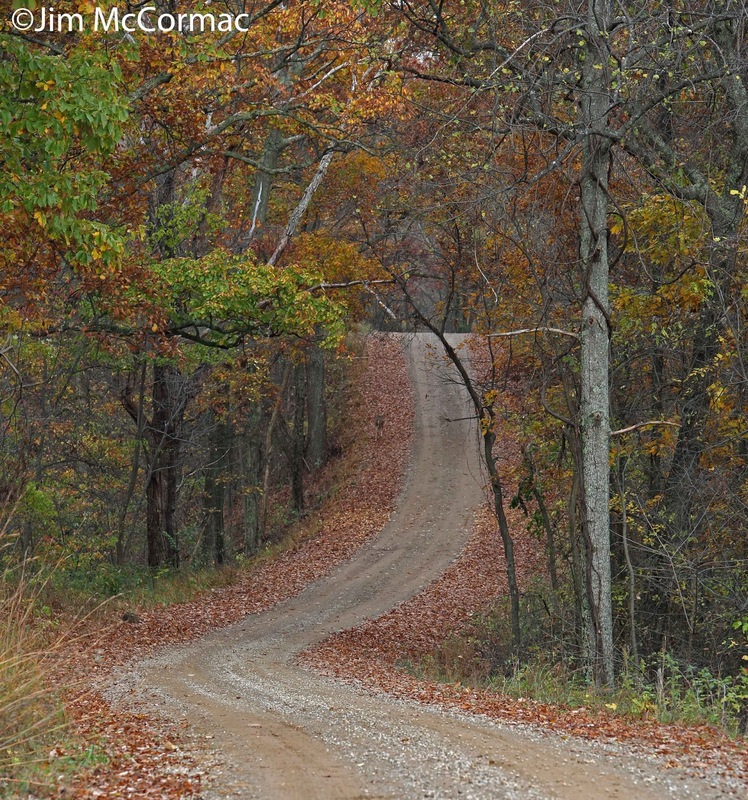 Today, the Crawford County Park System oversees its management. If you ever get the chance, stop by and check out this relict of our prairie past. Controlled burns seldom singe all of the vegetation, and in corner of the prairie the standing goldenrod had attracted one of my favorite birds, the American Tree Sparrow, Spizelloides americana. I heard their delicate notes before seeing the birds - the calls of a distant flock sounds like icicles falling and shattering. Occasionally a bird would deliver a truncated version of its song, a beautiful somewhat melancholy series of whistled notes. This was the first weekend that I've noticed this harbinger of winter in substantial numbers. Another sparrow, the Dark-eyed Junco, often gets props for being the "snowbird", but in my book the tree sparrow is the true snowbird. When they show up in numbers, winter with its frosty bite and sleet and snow will not be far behind. 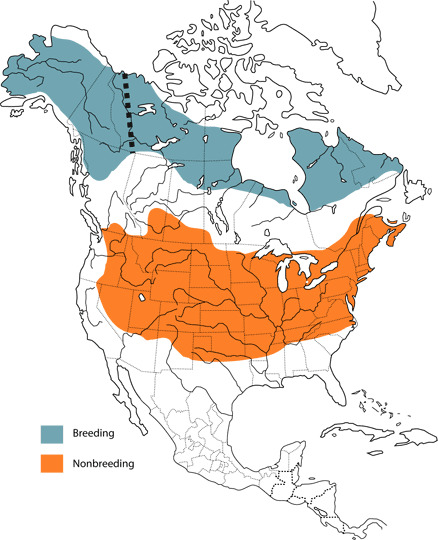 Map courtesy Birds of North America Online. American Tree Sparrows breed far to our north, beyond the range of most Homo sapiens. For such a common wintertime resident in the northern and central states, it is a surprisingly enigmatic bird insofar as its breeding ecology goes. Tree sparrows nest in places where most people don't go; indeed, can't go in most cases. The plucky little sparrows are common at backyard feeders when they come south, but feeders of course are a recent source of food for the birds. I have noticed time after time, over many years, their fondness for the fruit of goldenrod when encountering the birds in places wilder than the backyard. Goldenrods in the genus Solidago produce huge crops of seeds which are high in protein and fat, and the sparrows thrive on this fruit. I suspect goldenrods do the heavy lifting when it comes to supporting wintering American Tree Sparrows. We may temporarily entice the visiting northerners from the goldenrod patches with our feeders, but given a choice I think most tree sparrows prefer the wild crops of seeds. 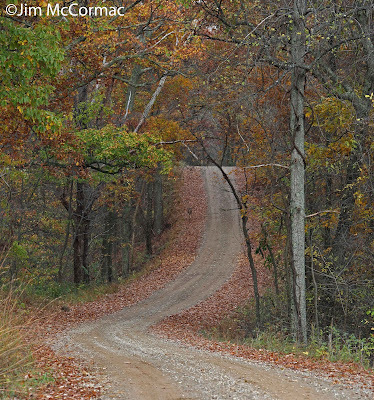 A gravel forest road winds through Shawnee State Forest in southern Ohio, as seen last Sunday. I spent the entire day down there stalking game with my camera. Fall's color had largely passed, and leaves were snowing to the ground. Temperatures were perfect for this time of year - about 60 F.
As always is the case when I am free to hunt down here unfettered, lots of interesting game was located. I returned with many "keeper" images of a wide diversity of subjects, both floral and faunal. The day started with a pretty cool bang, although I couldn't get documentary images of the incident. I located a sizeable mixed foraging flock of birds - chickadees, titmice, White-breasted Nuthatches, Yellow-rumped Warblers, both kinglets, and others - and was hanging discreetly on their periphery waiting for photo ops. Suddenly, I heard a loud ruffle of wings close behind, and whirled around to see that a tiny male Sharp-shinned Hawk had barreled into the scene. Its arrival was accompanied by protest scolds, then dead silence. I don't know if the fierce little hawk bagged anything, but man how I wish I could have got an action shot of the accipiter wing-braking and pivoting, eyes wild with bloodlust and talons splayed. 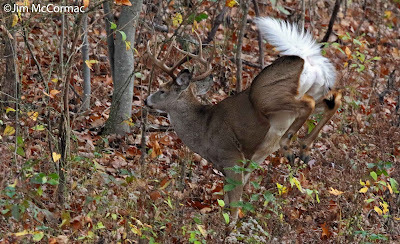 I did manage to catch this gorgeous ten point buck on pixels. It was strolling along a shaded woodland border, and allowed me to approach fairly closely. I was ready for it when it leapt up an embankment, flag tail flaring. 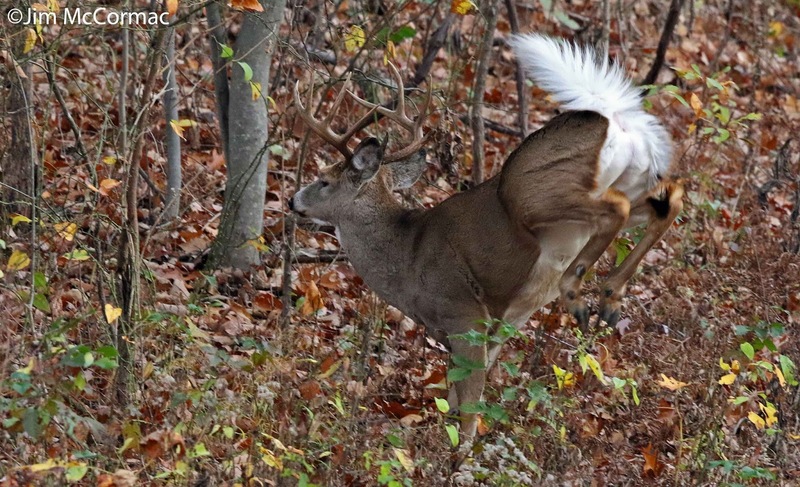 Speaking of bucks, it was a buck of a decidedly non-ungulate kind that was one of my targets this day. This gorgeous lepidopteran is a Buck Moth, Hemileuca maia, and they don't emerge until the Indian Summer days of very late fall. The moth is so named because of its emergence at about the same time buck deer are entering rut. 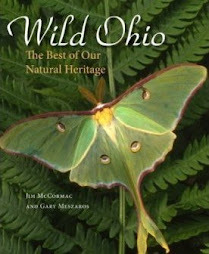 Buck Moths are local in Ohio, mostly in the southern counties, as well as a population in the Oak Openings near Toledo. Shawnee is probably the best place to hunt them. Buck Moths are day-fliers, and look like fluttering little Pandas when in flight. They're fairly large as moths go, and are easy to spot on the wing. Mid to late afternoon seems to bring the peak of activity, and I probably saw three dozen or more this day. 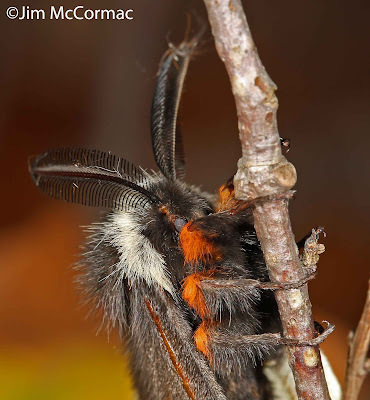 The way one typically sees Buck Moths is on the wing - males patrolling in an incessant search for girls. The challenge is getting close enough for photos. One way to do it as to deftly net one of the moths as it rockets by. But as soon as you bring it out of the net it'll just shoot off if not detained in some way. One way to do that is to chill it briefly in a cooler (which does not have any lasting ill effects), but I've never liked the look of the temporarily refrigerated animal - it looks understandably stiff and wooden. This is not a technique for me; I prefer stalking and shooting creatures on their own terms. Another way to go about the challenge of photographing Buck Moths requires more patience, and more luck. Just attempt to follow one of the animals as best as possible, and hope it 1) lands to rest, or 2) finds a female. Nearly all of the moths one sees flying about the forest are males, on the prowl for females. I hit pay dirt this day. A moth blistered by as I walked a ridgetop road, and I lit out in pursuit. It eventually veered into heavy undergrowth and seemed to vanish. As I moved in, I saw why it had disappeared. A female was dangling from a low branch, and her pheromones were pulling in the boys. 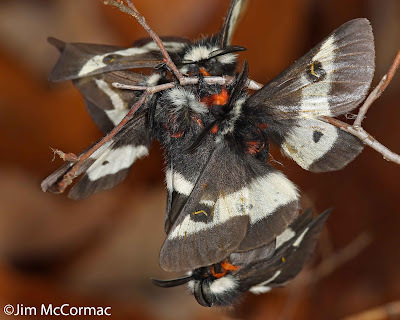 Buck Moths are silkworm moths (family Saturniidae) and they don't eat. Members of this group are basically large often colorful and ornately patterned flying gonads. They have no functional mouthparts, and exist only to find a mate, mate with that mate, and in the case of the female, drop eggs. 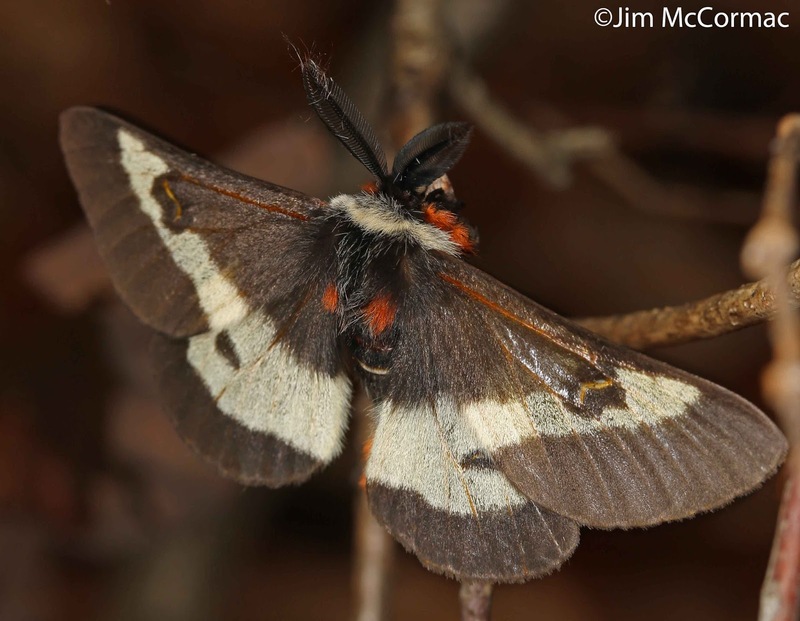 The males' large fernlike antennae are incredible pheromone receptors, and allow them to pick up the females' airborne cues from great distances. This is the scene that the amorous male moth that I chased led me to. 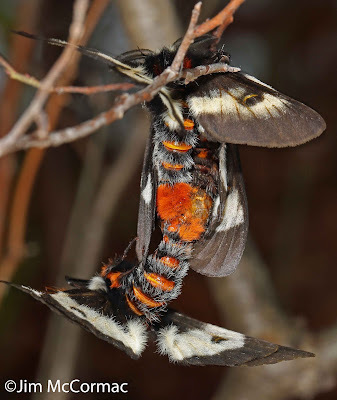 A female Buck Moth, with her larger abdomen, clings to a branch while coupled to a male, who dangles below. 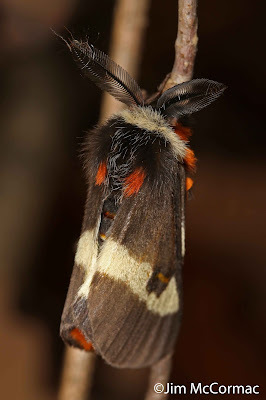 Note the gorgeous pattern and bright orange-red coloration of these moths, as well as their dense "fur". Thick hair allows the moths to better retain heat and fly in cool temperatures. I've seen Buck Moths active in temperatures in the low 50's F, and I'm sure they fly in cooler weather than that. Because these moths were so fixated on the business at hand, they were easy to closely approach. 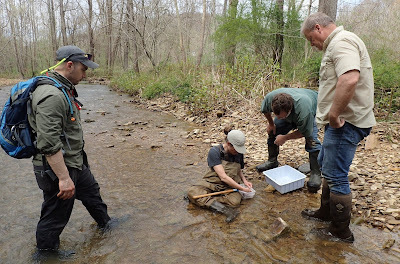 Their location was not easy to access, though, and necessitated pushing through some greenbriar and then laying on the leaf litter to get on their level. But eventually I was able to find a satisfactory position and make some images of the action. An incredible mating scrum creates a sizeable ball of Buck Moths. A constant procession of males kept bombarding the scene, and many of them would attempt to pile on. There are at least four interlopers swarming the mating couple in this shot. As I lay there watching the scene, moths would bat about my face, and I could even hear the soft whir of their wings as they excitedly fluttered about. Not a bad experience for the dedicated stalker of Buck Moths.